Andrews-Duncan House, 9 September 2018. 8×10 tintype by author. The long-languishing Andrews-Duncan House at 407 North Blount Street may have shed its last window screen, tossed its last corbel, and dropped its last roof slate. After years on the market, the State of North Carolina has a pending buyer for this property. The new owner plans to restore the house and what is even better… No wedding venue, office, or event space here—incredibly, the new owner intends to live in the seven bedroom, six bathroom, 10,000-plus square-foot mansion. N_53_16_4749 From the Albert Barden Collection, State Archives; Raleigh, NC. 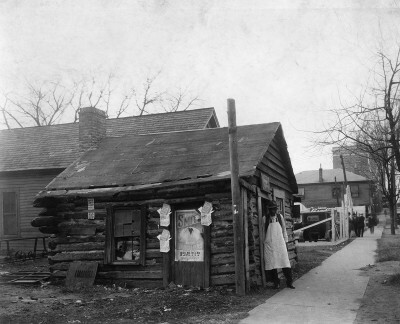 Pictured is the office of the Carolina Oxypathor Co. located at 124 W. Martin Street c. 1913, just a few doors down from the original News and Observer building. The photograph above was likely taken for an advertisement. Oxypathor—It already sounds bogus, right? Well, your suspicions are well-founded. In the early 1900s, as the marvels of electricity continued to permeate the everyday lives of Americans, the science behind electricity was a mystery to most people—it was magic. This presented a lucrative opportunity for quacks and charlatans across a variety of fields. Women are seen inside the office of the Carolina Oxypathor Co. N.53.17.519 From the Albert Barden Collection, State Archives; Raleigh, NC. One quack in particular, E. L. Moses of Buffalo, NY, developed the Oxypathor in 1910. This device consisted of a piece of tubular shaped metal filled with sand while its attached wires were fitted to a person’s wrists and ankles. The metal part sat in a bowl of water while the “patient” enjoyed the benefits of large quantities of oxygen absorbed through the skin. The Oxypathor claimed to heal a variety of conditions including disorders of the blood, pneumonia, typhoid fever, etc. Oxypathor device seen in display case at NC State Fair. N.53.16.4746 From the Albert Barden Collection, State Archives; Raleigh, NC. In reality it was a better paper weight. A 1914 article in the Journal of the American Medical Association stated, “The Oxypathor belongs in the same class as the left hind foot of a rabbit caught in a graveyard in the dark of the moon.” The device retailed for $35 and cost just over $1 to manufacture. The company was basically printing money. Between 1909 and 1914 approximately 45,000 units were sold for a profit of over one million dollars—around 30 million in today’s dollars. In 1914 criminal proceedings were brought against E. L. Moses and he served an 18 month prison sentence. The fate of the proprietor running the Raleigh location is unknown, but surely karma caught up with him.